Doing Race focuses on race and ethnicity in everyday life: what they are, how they work, and why they matter. Going to school and work, renting an apartment or buying a house, watching television, voting, listening to music, reading books and newspapers, attending religious services, and going to the doctor are all everyday activities that are influenced by assumptions about who counts, whom to trust, whom to care about, whom to include, and why. Race and ethnicity are powerful precisely because they organize modern society and play a large role in fueling violence around the globe. 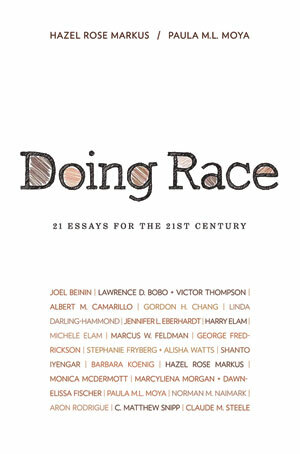 Doing Race is targeted to undergraduates; it begins with an introductory essay and includes original essays by well-known scholars. Drawing on the latest science and scholarship, the collected essays emphasize that race and ethnicity are not things that people or groups have or are, but rather sets of actions that people do. Doing Race provides compelling evidence that we are not yet in a “post-race” world and that race and ethnicity matter for everyone. Since race and ethnicity are the products of human actions, we can do them differently. Like studying the human genome or the laws of economics, understanding race and ethnicity is a necessary part of a twenty first century education. Doing Race pulls together original essays from some of the biggest names studying race today. The essays have been carefully edited to synthesize many of the ideas that their authors have discussed in academic journals and books, but without jargon and academic complexities. Doing Race is a multidisciplinary book, comparative across racial and ethnic groups, and global in scope. The essay authors are internationally renowned scholars who have influenced the development of those disciplines—psychology, history, political science, education, sociology, drama, communication, religious studies, literature—that have been central to the study of race and ethnicity. The essays are based on lectures presented by these scholars in a highly successful undergraduate course at Stanford University entitled Introduction to Comparative Studies in Race and Ethnicity. Doing Race offers a fresh approach at a price that is significantly lower than that of traditional textbooks and readers.